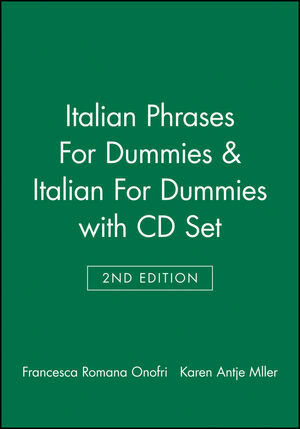 This is a set Italian Phrases For Dummies & Italian for Dummies, 2nd edition with a CD. 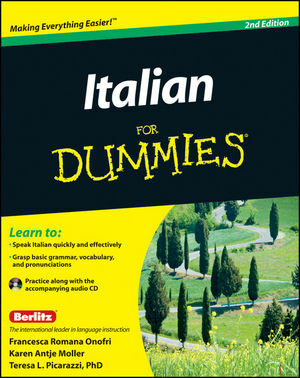 Everyday conversations in Italian made easy. Italy is a perennially popular destination for Americans, with three cities (Florence, Rome, and Venice) among the top ten in Travel & Leisure's 2003 "World's Best Cities" poll. 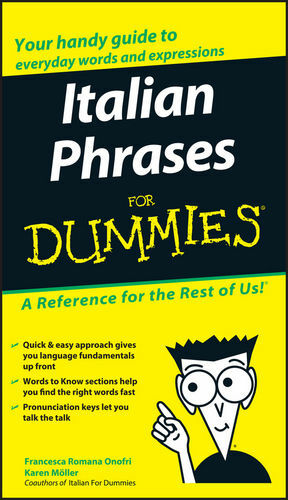 This concise, easy-to-use guide helps travelers and students get up to speed fast on conversational Italian, showcasing the most commonly used words and phrases. Francesca Romana Onofri is an Italian translator and teacher. Karen Moller is a writer who has worked on several Italian-language projects for Berlitz. Francesca Romana Onofri is an Italian teacher and translator. Karen Antje Moller is a veteran language teacher and author.